It is snowing in Hohhot, the capital of Inner Mongolia, but a big function room in a downtown hotel is bright, crowded and swelteringly warm. Hundreds of guests are milling about tables piled high with dumplings, slices of watermelon, glasses of wine and bottles of beer, while women in bright embroidered robes welcome latecomers. A stage is set up at one end of the room, and half a dozen photographers are setting up equipment. Then Anda Union take to the stage, and with them they bring the sounds of the grasslands that surround the “blue city”: galloping drum beats, traditional throat singing, the piercing ululations of the horse-head fiddle (imagine a small cello with two strings), and seven-part vocal harmonies. When the band finish, to raucous applause, they are given bunches of flowers and sky-blue ceremonial silk scarves. The gig, in early March, was a send-off for the band, who went on to play at Womad festivals in Australia and New Zealand. This autumn they’ll be introducing hordes of Scots to the sound of the Mongolian grassland when they perform 26 dates at the Edinburgh Festival’s art deco big top, the Spiegeltent. A documentary about the band, called Anda Union: From The Steppes to the City will also be making the rounds of film festivals across the country, and is expected to get a DVD release next year. There are six million Mongols in Inner Mongolia, a region of northern China, and although in Hohhot they are outnumbered ten to one by Han Chinese, they have their own distinct culture and language, and a traditionally nomadic way of life. Like their trilling language, which sounds nothing like the rounded sounds of Chinese, Mongolia’s religion has much in common with Tibet: a mixture of Buddhism and animism is practiced. The “dalai” of “dalai lama” is a Mongolian word, meaning ocean. 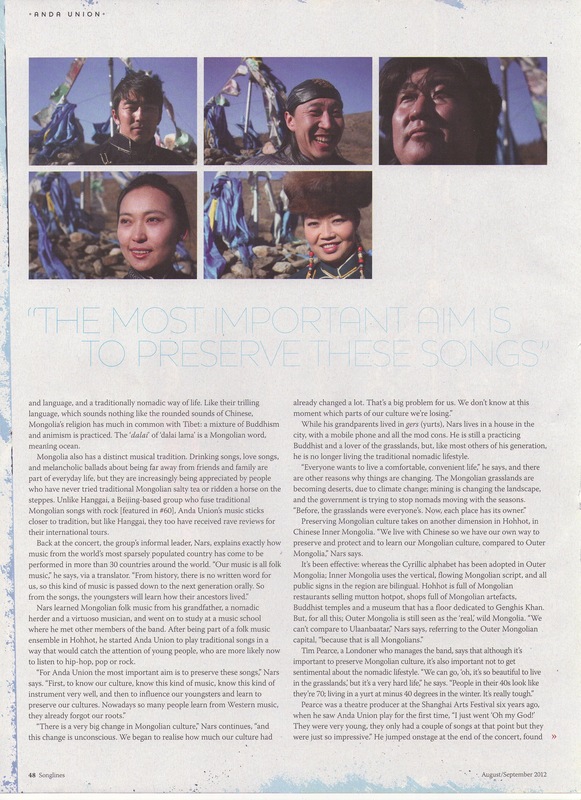 Mongolia also has a distinct musical tradition. Drinking songs, love songs, and melancholy ballads about being far away from friends and family are a part of everyday life, but they are increasingly being appreciated by people who have never tried traditional Mongolian salty tea or ridden a horse on the steppes. 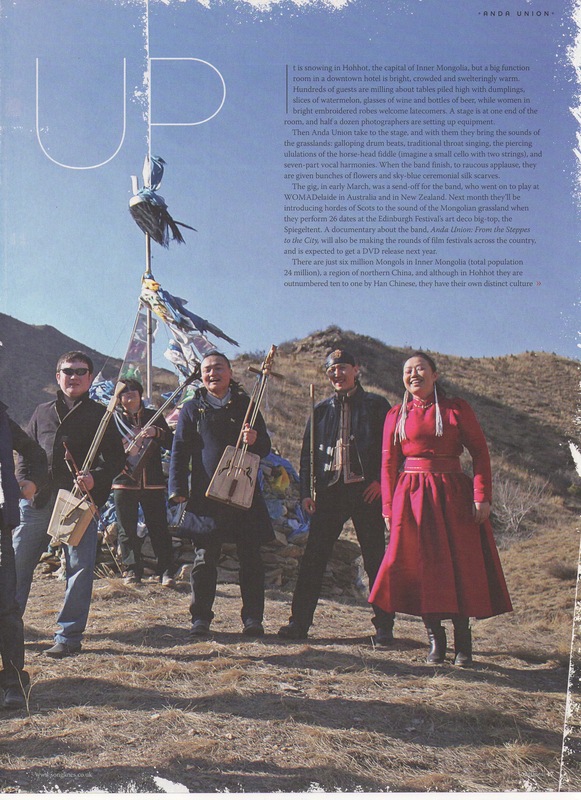 Songlines has previously profiled Hanggai, a Beijing-based group who fuse traditional Mongolian songs with rock; Anda Union’s music sticks closer to tradition, and like Hanggai have received rave reviews for their international tours. Nars learned Mongolian folk music from his grandfather, a nomadic herder and a virtuoso musician, and went on to study at a music school where he met other members of the band. After being part of a folk music ensemble in Hohhot, he started Anda Union to play traditional songs in a way that would catch the attention of young people, who are more likely now to listen to hip hop, pop or rock. While his grandparents lived in yurts (or gers, in Mongolian), Nars lives in a house in the city, with a mobile phone and all the mod cons. He is still a practicing Buddhist, a fan of traditional Mongolian food and a lover of the grasslands, but, like most others of his generation, he is no longer living the traditional nomadic lifestyle. Pearce was a theatre producer at the Shanghai Arts Festival six years ago, when he saw Anda Union play for the first time, “and I just went ‘Oh my God!’ They were very young, they only had a couple of songs at that point but they were just so impressive.” He jumped onstage at the end of the concert and found the band’s dressing room, and asked if he could come back to Inner Mongolia with them. They ended up spending a week together; Pearce recorded their music in a rehearsal room and managed to book the group two America tours. A few years later, he made the documentary about the band, in which each of the group’s members visit their family homes: a trip that took a month and covered 10,000km. In it, we see a ger being constructed, a Mongolian wedding, prayers being offered at a Buddhist temple and a sheep being killed for a feast in a traditional way. An incision is made in its stomach, and the main artery leading to the heart is closed off by hand. The animal dies relatively peacefully, looking at the sky. Running onstage at that concert in Shanghai changed Tim Pearce’s life “completely.” While making the documentary, his wife became pregnant, and when the couple’s daughter was born, they made the entire band the baby’s godparents, “so now they literally are family,” and called the girl Lily Anda. (Anda means “blood brother” in Mongolian, and is associated with a story about Genghis Khan.) He now goes back to Mongolia several times a year, and he has organised tours for the band around the world. 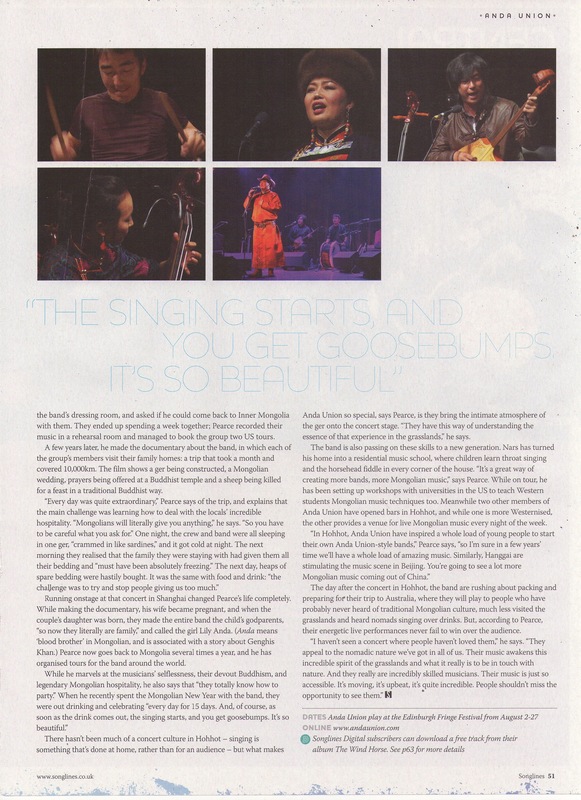 There hasn’t been much of a concert culture in Hohhot – singing is something that’s done at home, rather than for an audience – but what makes Anda Union so special, according to Pearce, is they bring the intimate atmosphere of the ger onto the concert stage. “They have this way of understanding the essence of that experience in the grasslands,” he says. The band is also passing on these skills to a new generation. Nars has turned his home into a residential music school, where children learn throat singing and the horsehead fiddle in every corner of the house. 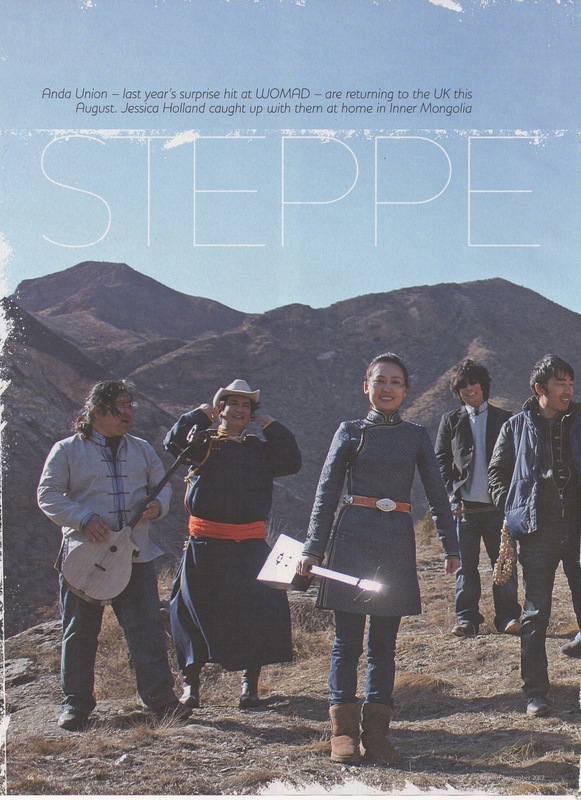 “It’s a great way of creating more bands, more Mongolian music,” says Pearce. While on tour, he has been setting up workshops with universities in America to teach Western students Mongolian music techniques too. Two other members of Anda Union, meanwhile, have opened bars in Hohhot, and while one is more Westernised, the other provides a venue for live Mongolian music every night of the week. The day after the concert in Hohhot, the band are rushing about packing and preparing for their trip to Australia, where they will play to people who have never heard of traditional Mongolian culture, much less visited the grasslands and heard nomads singing over drinks. But, according to Pearce, their energetic live performances never fail to win over the audience.